In her 20s, she traveled around Europe before coming to the United States in 1986. Eventually, she enrolled at the University of Mary Washington College in Fredericksburg, Va., where, in an art class, she discovered clay. “Clay is a seductive material,” she says. “I can touch it, and I can do certain things to it, but it also pushes back.” It was her initial experience with the material that led to a B.A. in studio art at her alma mater and, later, an M.F.A. in ceramics from James Madison University in Harrisonburg, Va.
Masthem works in a 16-foot by 16-foot studio attached to the back of her house. Each 18-inch-tall sculpture begins as a series of sketches, which she translates into clay. To makethe face, she forms a stacked coil of clay, which allows her to work the clay on the inside and outside of the coil as she creates the expression. She then glazes and stains the sculpture in different colors, and gives it a name. “I really enjoy the ‘making’ part of my art,” she says. “I feel wonderment that I get an idea and I can realize it. It’s like a ritual—the idea, the contact with the clay. It’s a ritual to express my creativity.” Oscar, Charles and Luke are $675 each. 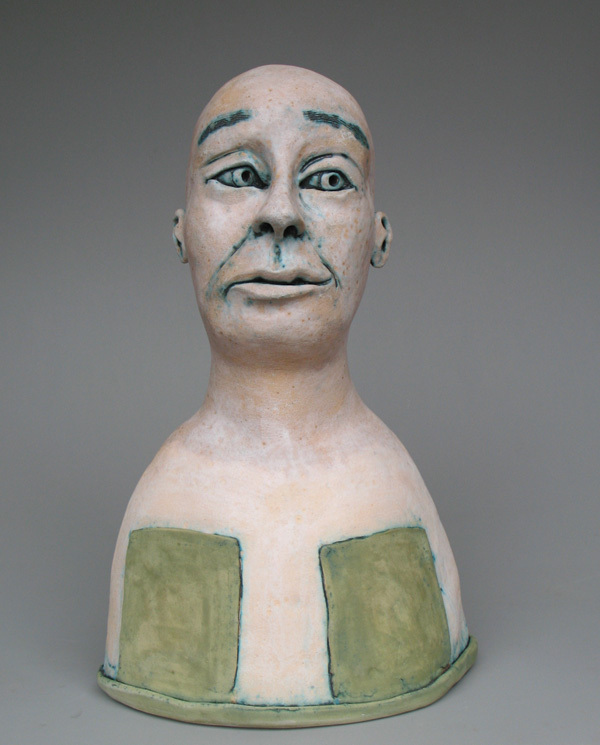 Contact ceramic artist Kicki Masthem through Caplan Art Designs (503-319-6437; caplanartdesigns.com). For more information about the artist, go to kickimasthem.com.